As reported on www.ChemOrbis.com, in Egypt, devaluation of the Egyptian pound back in October had caused prices for the locally held imported cargoes to gain significant increases. Hindered import purchases amidst higher exchange rates and longer customs clearance procedures had also limited the supply in the distribution market. Sellers, trying to avoid losses stemming from higher replacements costs, lifted their prices. Recently, players have started to report eased supplies in the distribution market, especially for PP. As a result of this improving supply situation and generally weak demand, locally held prices started to lose ground. In the PP raffia market, distributors’ locally held Middle Eastern offers were down EGP100-300/ton ($13-38/ton) on the week while their offers for Egyptian cargoes recorded up to EGP500/ton ($64/ton) decreases. Locally held PP film prices shed EGP100-300/ton ($13-38) and injection offers lost EGP300-900/ton ($38-115/ton). Despite the decreases and recently improved supplies, locally held PP film continues to carry around a $220-290/ton premium over locally held PP raffia and injection prices. PP film prices maintain their large premium over raffia and injection due to tight supplies. A trader commented, “PP prices saw downward adjustments given the slow demand and improved supplies in the distribution market. Sellers are more willing to negotiate their prices amidst sluggish market sentiment and ahead of the approaching year end.” Meanwhile, an injection products converter highlighted that they are suffering from weak end product demand and added that the eased supplies coupled with ongoing cash flow problems resulted in lower prices for locally held materials. In the PE market, a similar panorama was observed. 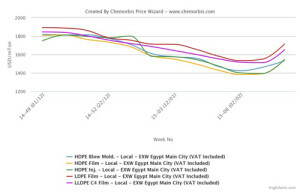 Locally held prices recorded decreases over this past week with LDPE film prices softening by EGP200-300/ton ($26-38/ton) and LLDPE film by EGP100/ton ($13/ton) at both ends of the range. 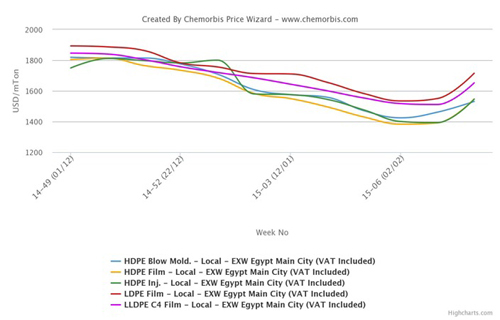 HDPE film offers remained steady at the low end but the high end came down by EGP600/ton ($77/ton) on the week. Despite the recent decreases, players highlighted that the local HDPE producer SIDPEC’s offers are still more competitive than distributors’ prices. A converter commented, “Overall supply levels are still not comfortable, but demand continues to be weak and this situation has resulted in some discounts.” Liquidity issues still persist in the market and sellers, in need of cash flow, are willing to lower their prices in order to conclude deals.